Throughout history, the mythological character of Orpheus has inspired many artists and in particular composers. The main story of his life - the loss of his beloved Euridice and his attempts to bring her back from the underworld, only to lose her again for ever - is tailor made for operas and cantatas. However, there is another aspect which in particular appealed to composers: at first he managed to set Euridice free thanks to his musical skills, and especially his superb singing. The story of Orpheus is also an ode to the power of music. The present disc includes songs and instrumental pieces from the English Renaissance. The title refers to Orpheus, but none of the pieces has anything to do with the story of his life. Even so, that story is used as a thread to order the pieces, or at least the vocal items. Anthony Rooley, in his liner-notes, links the various songs to episodes from Orpheus' life. He puts himself into Orpheus' shoes and writes about the latter's life as if it was his own. For instance, about Orpheus and Euridice: "And in our dreams we lamented not yet being together (Time, cruel time). And Time seemed a tortuous impasse to loving (Truth, trying time)." Unfortunately the booklet omits any information about the composers and their music. With songs for voice and lute, sometimes with an additional viola da gamba - most people immediately think of John Dowland. He is represented with a few pieces, among them two songs. But the largest part of the programme includes songs which are mostly little known, and that is one of the assets of this disc. Francis Pilkington held a number of positions as a church musician, but has become mainly known for his songs. Three collections of secular vocal pieces were published between 1605 and 1624. The two songs are from The First Booke of Songs or Ayres of 1605; like Dowland's song books these are for four voices with accompaniment of a plucked instrument and a viol, but can be performed by a solo voice as well. Music dear solace is especially relevant in regard to Orpheus; the third stanza includes a reference to Apollo, the god of music. Very little is known about the life and career of William Corkine. With the exception of one anthem his output comprises only secular vocal music and pieces for lyra viol. Romina Lischka plays three of the latter in the tracks 14 to 16: a Prelude, the Mounsiers Almaine and a Coranto. The song Come live with me and be my life is also played on the viol. Corkine is the composer of the song I quoted from Rooley's liner-notes, Truth, trying time, whose first stanza ends with the line: "My Love in her did rise, did live, did fall." A little better known than these two is John Danyel who was a lutenist by profession. He is generally considered one of the best composers of lute songs; all his songs are included in his only printed collection of music, the Songs for the Lute, Viol and Voice of 1606. Many of his songs are mournful, "even lugubrious", according to New Grove. Among his best-known songs are Can doleful notes, No let chromatic tunes and Uncertain certain turns - a song in three sections which includes strong chromaticism. This is used to express the unhappiness of the soul: "Chromatic tunes most like my passions sound, as if combined to bear their falling part". Of a much happier nature is Like as the lute delights. 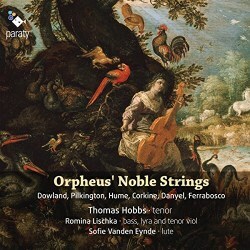 Tobias Hume was a master of the viola da gamba and especially the playing of the lyra viol, or rather the playing of the viol the lyra way. In 1605 a collection of his pieces was printed, two years later a reprint came from the press which included some new pieces. The virgines muse and Musickes delight are examples of his art on the viol; it is here accompanied by the lute. The collections also include some songs. Cease leaden slumber is a song about music: "My genius presents the cause of sweet music's meaning". What greater grief has a pretty desperate tenor: "No man unhappier lives on earth then I". With this song we approach the end of the programme. Like Orpheus' life it doesn't end on a happy note. It is fitting that John Dowland - who earlier expressed the happiness of love in Come away, come sweet love - turns up again with Go nightly cares. "[In] my journey to Hell I experienced the darkest night of my soul, from which I know I will never recover" ("Welcome sweet death, oh life, no life, a hell, Then thus, and thus I bid the world farewell."). William Corkine has the last word: Down, down, proud mind which expresses a glimmer of hope. "This fall from pride my rising is from grief's great deep that bottom wants, up to the top of happy bliss. In peace and rest I shall securely sleep, where neither scorn, disdain, love's torment, grief or anguish is." Like I said, this disc includes mostly little-known songs. The names of Corkine, Pilkington, Danyel and Campion don't often appear in concert programmes or on disc. That is a real shame as this programme shows. The songs included here are very fine and make one curious about the rest of their output. One can only hope that singers who want to explore the lute song repertoire, are willing to look beyond the obvious and realise that there is more than John Dowland. The pieces for viol by Corkine are excellent stuff and unjustly overlooked. I am happy to say that this disc is not only worth being investigated for reasons of repertoire. Most music lovers probably know Thomas Hobbs in the first place as a Bach interpreter who often works with Philippe Herreweghe. But here he shows that he is an outstanding singer of lute songs as well. His diction is immaculate, and as a result the text is always clearly understandable. He adds tasteful ornamentation, without any exaggeration. My only regret is that he uses modern English pronunciation, but in all fairness it has to be said that the adoption of historical pronunciation in English secular music of the renaissance is still very rare. It is really about time that this changed. I would also have preferred the recording to be a bit more intimate. A church is not the most appropriate venue for this kind of repertoire. Lastly I need to add that, with Romina Lischka and Sofie Vanden Eynde, Hobbs has two congenial partners who give fine performances of the instrumental pieces. The mixture of vocal and instrumental items and the order of the pieces results in a highly compelling programme which every lover of English renaissance music should savour.